The basketball season in District 9 came to an end this past weekend with three teams bowing out in the PIAA Quarterfinal run, a very respectable showing for District 9. So it got me thinking, what were some of the best moments, storylines of the 2019 basketball playoffs in the District – both in the D9 and PIAA playoffs. I have come up with a Top 10 list of my favorite moments from the playoffs. When you are in a tie game and the other team has the ball with under 10 seconds to play, all you are really hoping for is overtime. Unless of course, you have Owen Chambers on your team. With less than four seconds to go and South Side Beaver holding for the last shot, Chambers stepped into the passing lane, stole the ball, hurried down the court and then launched a 3-pointer from the right wing that was nothing but net to give Coudersport the win. The sequence easily goes down as one of the top finishes in a PIAA playoff game for a District 9 team ever. During the football playoffs, Wilmington took Ridgway behind the woodshed building a 35-point lead late in the first half. But that wasn’t enough for the Greyhounds, who called timeouts when the Elkers were facing third-and-30 from the 2-yard line and fourth-and-31 from the 1-yard line late in the opening half so they could score again. Fast forward four months later, and the two schools met again, this time on the hardwood. In a close game, Wilmington found itself up one, 36-35, following a late-game 6-0 spurt, and the Greyhounds seemed poised to end another season for Ridgway. But Jake Reynolds was having none of that. The senior hit a 3-pointer from the right wing – what is it about D9 players and the right wing – to give the Elkers a 38-36 lead with 38.6 seconds left. 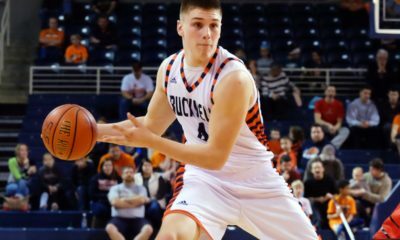 But he wasn’t done yet, as he blocked Robert Pontius potential game-winning 3-pointer with just over four seconds left to complete the victory. 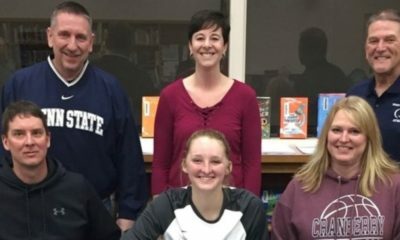 After winning back-to-back District 9 Class 1A titles, many expected the North Clarion girls’ basketball team to take a step back in 2019 after losing the greatest player in school history and one of the top players in District 9 history – Tori Obenrader – to graduation. But the She-Wolves would have none of that and found themselves back in the title game for the third straight season. Early on, it looked like North Clarion was going to run away with the title building an 11-point lead, 24-13, early in the second quarter. But Johnsonburg fought back, and the Ramettes tied the game on a Cassidy King basket with just over two minutes to play. Enter Gabby Schmader. The North Clarion junior guard hadn’t scored the entire game and was struggling with her shot. But she didn’t stop shooting, and when she found herself open in the right corner with just under 40 seconds to play, she let the shot go again. 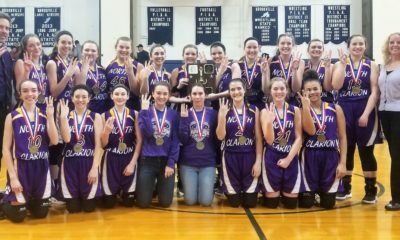 And this time it was pay dirt, as the 3-pointer gave the She-Wolves a lead they would never relinquish and was arguably the biggest shot in North Clarion girls’ basketball history. In the moments after Kane’s District 9 girls’ 2A semifinal win over Clarion, Lady Wolves head coach Dave Kiehl suffered a heart attack. Kiehl had to be rushed to the hospital and underwent surgery – he recovered nicely enough to actually coach in the PIAA Quarterfinals. So going into the title game against, A-C Valley, a game that had seen Kane go 0-7 in its history in, assistant coach Kerry Wolbert was behind the bench while Kiehl recovered. Kiehl’s players decided it was time to win one for the coach, but it didn’t come without a fight. Kane built a 10-point lead going to the fourth quarter only to watch A-C Valley rally and tie the game at 48 at the end of regulation. But the Lady Wolves weren’t going to be denied and made sure their coach got his long-coveted championship, outscoring the Lady Falcons, 13-4, in overtime to claim the school’s first title in girls’ basketball. In almost every instance when a District 9 teams face a WPIAL champion, the District 9 team is a prohibitive underdog. That was definitely the case when the D9 runner-up A-C Valley took on WPIAL champion Our Lady of Sacred Heart in the second round of the PIAA Class 2A girls’ tournament at Armstrong High School. And, despite the Lady Falcons hanging tough through three quarters, the script looked like it was going to continue when the Chargers took a 22-16 lead going to the fourth quarter. But A-C Valley was a fourth-quarter team all season, and the Lady Falcons responded with baskets by Rachel Cullen and Cami McNany off offensive rebounds early in the fourth quarter to get back within two, 22-20. OLSH, though, seemed to answer and end A-C Valley’s hopes when Ashley Norling hit a 3-pointer with 6:04 left in regulation to push the lead back to five. Little did anyone know that would be OLSH’s final field goal of the game. The Lady Falcons fought back and closed within three, 29-26, when Olivia Boocks was fouled taking a 3-pointer with 13.6 seconds left. Boocks, however, missed the first free throw before hitting the next two to leave A-C Valley down one. OLSH then missed a free throw, and Boocks was again fouled, this time on a drive to the basket with 1.5 to play. But again the senior missed the first free throw, and OLSH called time to freeze her. It didn’t work, Boocks hit the second charity shot to send the game to overtime. In overtime, McNany scored off the opening tip-off, and A-C Valley never relinquished the lead pulling off the stunning upset. 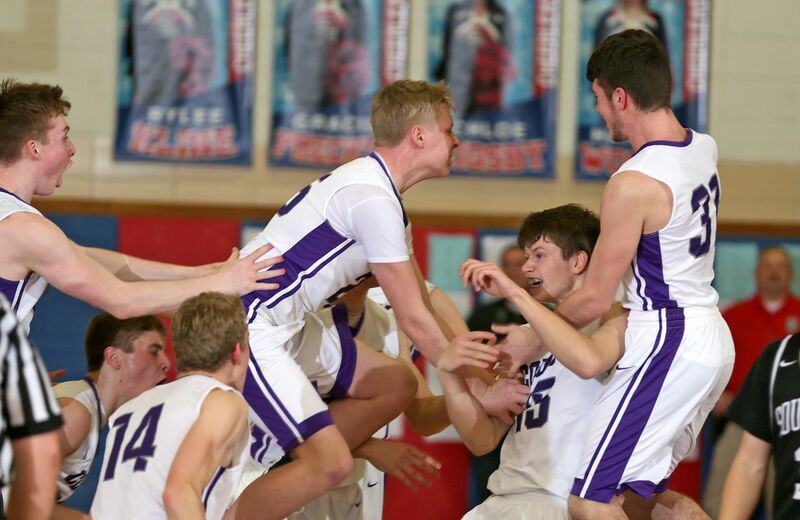 Keystone, one of the top programs in District 9 boys’ basketball history, had hit a drought of sorts in the 2010s having made the PIAA playoffs just once in the decade, in 2010. 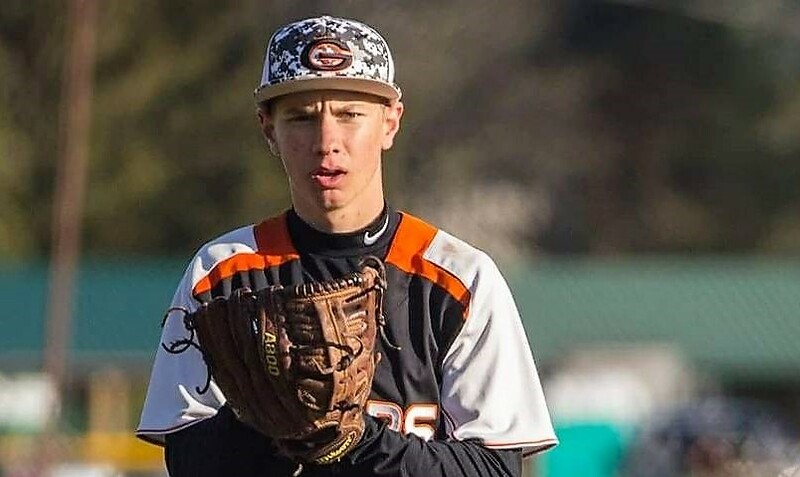 In 2019, the Panthers found themselves in a winner-moves-on-loser-goes-home consolation game against rival Karns City, a team it had split with during the regular season, after falling in the semifinals by four to eventual D9 champion Ridgway. In a back-and-forth contest, Keystone led by three, 47-44, late in regulation only to see Austin Fahlor hit a 3-pointer with one second left for Karns City to send the game to overtime. The Gremlins then took a 54-53 lead in overtime and had the ball. But Karns City missed a pair of free throws giving Keystone the ball back with 20 seconds to play. Following a timeout, Dawson Steele drove for a layup but had the shot come up short. Isaak Jones collected the offensive rebound and kicked the ball to LaVan, who buried the game-winning 3-pointer from the left wing to send the Panthers to the PIAAs. Everyone thought the 2018 Ridgway team was destined for D9 glory. But Coudersport ruined those plans with a 20-point victory in the D9 2A title game. Fast forward a year, and the same two teams found themselves battling it out for the title once again. Coudersport, looking for its third straight D9 title, led by four, 43-39, going to the fourth quarter before Ridgway scored the first five points of the quarter to go up one, 44-43. The teams traded leads, and the Elkers took a 50-48 lead on free throws with just under a minute to play. Hayden Keck then tied the game for Coudersport with 45 seconds to play before Ridgway held for a late shot and got it when Zack Zameroski scored on a layup off a Daunte Allegretto pass with 4.4 seconds to play. After knocking off Moniteau in the District 9 Class 2A title game, the Brookville boys’ basketball team still had work to do to qualify for the PIAA playoffs since District 9 has only three Class 3A teams. The Raiders had to face off against District 5 champion Everett in a play-in game at Pitt-Johnstown. Everett came into the game thinking it was the heavy favorite with a record of 22-2 and riding a 16-game win streak. And late in the second quarter, those thoughts seemed legit when the Warriors built a 20-10 lead. But Brookville scored seven of the final 10 points of the half to close within six, 23-17, at halftime. Everett pushed the lead back to nine three times in the second half, but the Raiders wouldn’t go away using a 16-2 run in the fourth quarter to take a 43-38 lead with 3:20 to play. The Warriors pushed back and retook the lead, 44-43, on a Seth Price layup with 39 seconds left. Enter sophomore Jack Krug, probably more famous for his left arm in football than for his basketball prowess, although he is a pretty good hoops player too. Krug found an opening with 18.5 seconds left and put Brookville ahead for good, and the Raiders then hit some free throws down the stretch to earn the PIAA bid. The game itself was one Coudersport would like to forget, as a powerful Bishop Guilfoyle team used an 11-0 run late in the first half to build a 12-point halftime lead on its way to the victory. But the part no one will forget, came in the third quarter with 1:52 left on the clock. 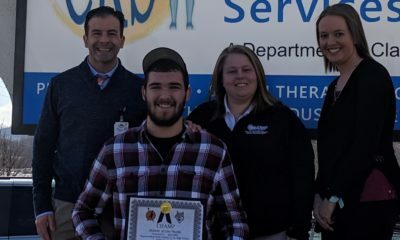 That is when Falcons senior Owen Chambers hit two free throws to become the all-time leading scorer in District 9 boys’ basketball history surpassing the record of 2,257 points set by Johnsonburg’s Calvin Grumley, who graduated in 2007. Chambers ended the night with 30 points and finished his career with 2,269 points. Down 11 at halftime and down 10, 38-28, late in the third quarter, Ridgway went on a game-ending 32-13 run that was aided late by Sewickley Academy losing its collective mind, to oust the Panthers, who had beaten the Elkers in the 2018 second round. Still down 47-45 with 1:20 to play, Daunte Allegretto gave Ridgway its first lead since 5-2 when he nailed a 3-pointer to put the Elkers ahead 48-47. Isiah Warfield tied the game at 48 with a free throw before Matt Dush gave Ridgway the lead back, 49-48, with a free throw of his own with just under a minute to play. Zack Zameroski then hit two more free throws with 30 seconds left to push the Elkers lead to 51-48. Things then went completely bonkers after that. Sewickley Academy missed a shot, and Zameroski collected the rebound and was fouled. The Sewickley Academy player was then whistled for a technical foul, and Zameroski proceeded to hit 3 of 4 free throws to make it 54-48. Sewickley Academy head coach Win Palmer then received a technical foul, and Panthers senior Donald Belt was also called for a flagrant foul and ejected from the game. The end result was a 60-48 Ridgway lead with Jake Reynolds making a basket and one of two free throws and Zameroski splitting two free throws and Dush hitting 2 of 2 from the line putting the game away.